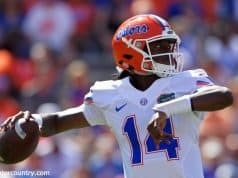 With two open scholarships still remaining for the Gators they are looking to use at least one of them to get some immediate help at the 3 and 4 spots, an area with lots of available minutes. 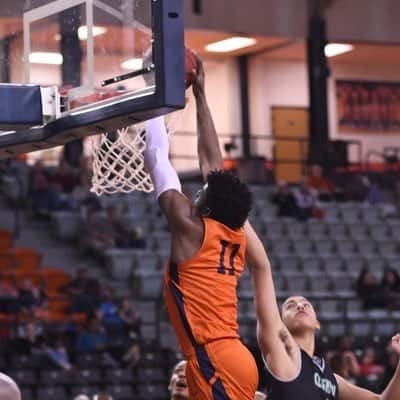 A player Florida has pursued to fill the void is Trey Wade, a player who started his career at UTEP before heading to junior college at South Plains in Texas. A do-it-all forward with excellent athleticism, nice shooting touch, and a nose for rebounding the basketball you can certainly see why Coach White and his staff are interesting and the fact he’d be an instantly eligible player would cover up a roster concern. I had the chance to get to know Trey and ask him about his basketball journey, what he excels at on the floor, and what he’s looking for in his next college decision. EF: Thanks for doing this Trey, I really appreciate your time! 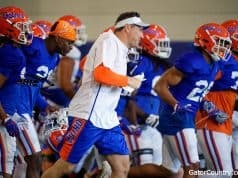 First off, can you tell everyone a bit of your basketball story… where you’re from, where you’ve played, everything that has gotten you to this point where you’re receiving power 5 offers from teams like Florida. TW: Well I am from Marietta, Georgia, the Atlanta area. Out of high school I was signed to UTEP and was a non-qualifier so I was considered a prop 48. I sat out my first year and played the next. Due to a coaching change I made to decision to move on also. Me being a non-qualifier I wasn’t heavily recruited so I decided to go to junior college for a year just so I could really get a chance at that process! EF: How do you feel your year of JUCO helped you grow both on and off the court? TW: JUCO has helped me become a better leader everyday, especially in practice. And it was an opportunity for me to step into a spot and play a huge role in a program that was really good, so it definitely helped me with competing against good players! Working and building confidence. EF: I’m glad to hear you were able to use the JUCO year to grow as not every player does! From a basketball standpoint can you describe yourself as a player? TW: Man, I’m a guy that can do a lot of things and play a lot of positions. I can put it on the floor, I can shot it, and I can make the right passes. I think with my abilities I create a lot of mismatches on the court down low and up top. I also can guard multiple positions. EF: So this might surprise you Trey but I’m actually fairly familiar with you as a player. Two years ago I was doing some writing covering Canadians in the NCAA so I found myself watching UTEP games to see your former teammates Matt Willms and Isiah Osborne and because I love one of your teammates Jonah Antonio at South Plains I caught a few of your games this year! One thing I noticed was that at UTEP you were played more at the wing and at South Plains you were used in the front court. As you go back to D1 do you see yourself playing one of these positions more than the other and is there a position you think you’d be better at? TW: Well see, that’s the great part! I think it all depends on where I’m more productive at. But moving back up I think I see myself playing more on the wing at the D1 level. Isiah and Matt Willms are my guys! Miss playing with them. EF: That’s a great mindset to have! 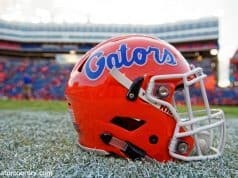 Well, Florida has minute needs at both the 3 and the 4 so I can see why they’re interested in you. Another thing I noticed between watching you at UTEP and South Plains was your jump shot. You shot the 3 really well at UTEP but had a bit of a cold streak at the end at South Plains and didn’t end with a great percentage. What do you think caused the dip in your 3-point shooting and are you confident you’ll improve next season? TW: Yeah man I can’t tell you what happened to be honest, I was shooting the ball well the first half of the season then when we came back from break I just had a cold spell. But I’m definitely in the gym all the time so I’m positive I’ll shoot the ball much better. EF: Well I appreciate the honesty! Seeing how well you shot the ball at UTEP and for the first part of the season I’m sure those shots will start falling. Can you tell the story of when Florida first got in touch with you? TW: Coach Pinkins started recruiting me towards the beginning of the season but him and Coach White didn’t offer me ‘till towards the end. EF: What other teams have you been talking to recently? TW: Oklahoma State, Oregon State, Minnesota, Wichita State. EF: Good for you! Do you think schools like that would have been recruiting you out of high school if not for the non-qualifier situation or do you think you became a high major player over the last two seasons? TW: Yeah for sure. I played in a tough region with a lot of great players who were playing at that level! EF: You’re a great athlete who has had some highlight reel dunks over the past couple years. Other than throwing down in traffic how do you find your athleticism gives you an advantage on the floor? TW: Definitely allowing me to run in the open court and finishing at the rim! Also I think my athleticism will help me defend a lot of shots at the rim. EF: What are some of the factors you’re weighing in to your decision of where you’ll play basketball next year? TW: Really looking for a right fit. I want to be a part of a winning culture. And a coaching staff that is really going to believe in me! EF: Going back to your basketball journey, you took the route through JUCO and while it worked great for you, it doesn’t work well for everyone. What advice would you give to someone contemplating the JUCO route? TW: I would tell them to go somewhere where you are going to compete for a title and get better everyday. EF: What will you be working on this summer before next season, whether it be honing an ability you already have or adding a new skill entirely? TW: Really trying to come in and be in the best shape I can be. EF: I watched your brother Trevin play at Montverde with current Gator Andrew Nembhard and he played with you at South Plains this season. Two questions…what was it like playing with your brother, and who would win in a game of 1 on 1? Actually 3 questions… Who would win in a dunk contest between you two because just like you, Trevin can really get up! TW: I have been playing with my brother my whole life so it’s always fun to hve my brother on my team. And I would kill him in one on one (laughs) too small. And he would probably beat me in a dunk contest, he has all the tricks. EF: (laughs) You probably have 7 inches on your brother and I don’t expect you to take it easy on him. So are you looking to make a decision sooner than later or are you going to wait until later in the spring or summer to make your decision? Is there any timeline you have in mind? TW: Well I think I’m going to take all my visits then decide. EF: Do you have a trip to Florida planned? TW: Yes, the 19th I’ll be out there. EF: Fantastic, well I will definitely be asking you how it went afterwards! Thanks so much for doing this Trey, you seem like an outstanding man and you’re a great player. One last question…what has been the highlight of your basketball career up until this moment. TW: Probably signing my first D1 letter of intent. But I think the best has yet to come! EF: Awesome! Thanks for the time man, and I look forward to hearing about your Florida visit in a few weeks, I’ll be in touch! TW: Appreciate it, you my man. You can follow Trey on Twitter at @treywade35.